Ever since I was a little girl, if you asked me where I dreamed of going one day, I would tell you Italy and specifically Rome! When my dream of visiting Rome finally came true, I was overwhelmed with excitement, and rightfully so. Rome is full of amazing historic sites surrounded by all the modern luxuries a girl could need. I couldn’t wait to get my hands on Roman forum tickets and figure out how to skip the line at the Colosseum. I must admit I was smitten with Rome! Planning was a little overwhelming, I understand! If you need a sample itinerary, here’s a 10 Day Italy itinerary that includes Rome, and of course, my list of 25 Awesome Things to do in Rome! Now granted, several items on this list are touristy, but do them anyway, especially if you are here for the first time. It’s ok to be a cheesy tourist sometimes! So buckle your seat belt and get ready for….25 Awesome Things to do in Rome! I know, I know, super touristy! Keep in mind though that the saying is that if you throw a coin in the Trevi that you will return to Rome again. Well, I don’t know about you, but I wasn’t willing to risk it. I had to throw a coin in the Trevi! I mean really, putting a coin into that fountain was one of my top things to do in Rome. This ritual was going to ensure I was coming back! I just hope that you have better luck than we did. Marty and I planned our walk to the Trevi one evening as we had heard it was more romantic to visit at night. Strolling on the cobblestone streets hand and hand, anticipating that glimpse of the beautiful fountain was pretty romantic. Well, until we arrived at the Trevi that is. We arrived to find our anticipated fountain completely drained and covered in scaffolding and glass barrier?! What the what?? Apparently, it was closed for cleaning and maintenance! Really?! In the middle of the summer high season? Needless to say, I was a little disappointed. Seeing a large crowd gathering toward the front, we made our way over to see people taking selfies and throwing coins over their shoulder. Observing a little further, I noticed there was a small pool of water left in the very front ensuring that tourist could still toss their coins. Pushing our way through the crowds, we did the same. After taking the iconic selfie and tossing our coin, I just knew we would return to Rome! In our post, Ultimate Guide to Visiting Ancient Rome, we tell you all the ins and outs of visiting the major sites of Ancient Rome, including the Colosseum, Palatine Hill, and the Forum, all of which are awesome things to do in Rome. Trust me when I tell you that you don’t want to see the Colosseum like every other tourist. It’s much more fun to get down in the tunnels and experience the Colosseum like a gladiator would have! So don your favorite gladiator outfit, complete with sword and shield, and get ready to see the Colosseum on a totally different level than most tourists (literally, you will be able to go to the lower levels that are off limits to the general public). If people ask you why you’re wearing a gladiator outfit, just tell them it was one of the 25 Awesome Things to do in Rome! Begin by booking your underground tour, then get ready to be amazed! This 3.5-hour tour allows you to skip the line and have access to areas normally off limits like the underground tunnels. When looking down into the Colosseum from the stands, you are viewing the underground tunnels. The tunnels would have been covered by a floor that was the actual arena where all the action would take place. The tunnels were where the animals used to be housed while waiting for their appearance above. Gladiators would also roam the tunnels below warming up and preparing for their fight as well. The underground tour also includes the Forum and Palatine Hill, areas that you will definitely want to visit as well! Literally, you are walking where Caesar walked when you step foot into the Roman Forum. The Roman Forum was the center of life in the city. Here you would have found political, commercial, and religious activities taking place on a daily basis. The streets would have been bustling with activity and lined with the grandest buildings in the land. Gawk at the amazing ruins and imagine life as it would have been when Rome was an incredible empire ruling this vast land. If you booked the underground tour mentioned above, then your guide will walk you through the Roman Forum as well, explaining the significance of this area and the buildings. If the underground tour is not for you, you might want to consider a walking tour of the Roman Forum and Palatine Hill instead. Having a guide is so beneficial to get the most out of your experience to Ancient Rome. Think of Palatine Hill as the Lifestyles of the Rich and Famous of Ancient Rome. This is where the Roman elite built their incredible houses and lived out their daily lives. I mean, this is where you would have wanted to live if you could afford it also. The hill allowed you to be above the dirt and squalor below while also giving you some amazing views of the sights below including the Colosseum and the Forum. Pretty sweet digs! We go into more detail on visiting Palatine Hill in our post, Ultimate Guide to Visiting Ancient Rome. Now granted, this one doesn’t sound like the most exciting thing, but it could be! Let me paint a quick picture for you. Marty and I are making our way to the Spanish Steps. On the way, we get hassled by a guy trying to give me a rose (which I didn’t touch because I know they are just after my money). Upon arriving at the beautiful Spanish Steps, there are people sitting everywhere. I mean, why not, it’s a gorgeous summer evening in Rome! Marty and I find our spot and sit down on the famous steps and begin our people watching. Suddenly, a guy leaps over my legs, missing me only by a couple of inches. Of course, we are wondering why this crazy guy is running down the steps leaping over people when all of a sudden about 20 more guys start doing the same thing. Now we are really wondering what in the world is happening. Then we see it, a wall of police officers are now running down the stairs also, chasing these guys. If I had only known sooner, I could have for sure nabbed the one jumping over me for them. I mean, one quick grab of the ankle and he would have eaten the Spanish Steps! LOL! And that, my friends, is why sitting on the Spanish Steps is one of the awesome things to do in Rome! Originally built as a tomb for Emperor Hadrian, Castel Sant’Angelo has served many purposes throughout history. Castel Sant’Angelo has been a prison, a castle, a refuge, and is now a museum. Take note that the castle is closed on Monday, so plan accordingly. Now once you’re inside, be ready to get a workout, there are a lot of stairs! After touring the museum, be sure and take time to go up to the rooftop for an amazing view of Rome. The land where St. Peter’s is located was originally the site of Nero’s Circus, a huge chariot racecourse. For half-time entertainment, the Romans forced Christians to fight wild animals and gladiators. One of these Christians was Peter, one of Jesus’ disciples. After his death, his remains were buried in a cemetery located where the basilica stands today. Today the beautiful chapel, with it’s Michelangelo designed dome, is surrounded by St. Peter’s Square, with its beautiful ring of columns. Standing here, you can’t help but feel all of the history that surrounds you. In our post, 21 Things to Know Before Visiting Rome, we remind you of the importance of bringing the right clothes to Rome. Visiting Rome’s famous churches is the reason for this reminder. You have to have modest clothing to go inside, no bare knees or shoulders. Because it is on everyone’s list of things to do in Rome, St. Peter’s is almost always crowded, so just be ready. You can avoid the crowds by visiting early (before 10:00 am) or come later in the evening (after 4:00 pm). Do note if you are visiting after 4:00 pm, the crypt is closed, and the area around the altar is roped off to prepare for the 5:00 pm mass. The Vatican offers free tours of St. Peter’s that last about 1.5 hours. The tours depart from the information center at 2:15 Monday-Friday, and then 9:45 am on Tuesday and Thursday. You can also rent an audioguide from the information desk if you prefer. For a more intimate experience, you might consider taking a small group tour with early access to the Vatican, St. Peter’s Basilica and the Sistine Chapel. You can’t pass up a chance to admire the beautiful work of Michelangelo. Believe it or not, Michelangelo didn’t want to be involved in the Sistine Chapel project, but after much bribery and threatening from Pope Julius II, he finally conceded and created the masterpiece that still draws millions of visitors today. Do some shoulder rolls and neck stretches to prepare for the neck craning that’s about to take place. You may also want to prepare yourself for the crowds of people that are about to be around you, this place gets crowded. To avoid some of this, consider taking a private guided tour in order to get the full history and effect of the Vatican as this too is one of the top things to do in Rome. Finding a little quiet from the bustling city streets of Rome doesn’t hurt anyone, and you will find just that on the Appian Way. Walking down the Appian Way was a surreal experience to me. I mean, I was literally walking on a road that was created in 312 B.C. Those of you from Texas know what I’m saying when I tell you we can’t build a road that lasts 20 years, much less 2,000! Surrounded by crumbling monuments, catacombs, and peaceful surroundings, the Appian Way is definitely an awesome thing to do in Rome. From Rome, take the Metro line A to the Colli Albani stop, and then catch bus #660 and ride about 15 minutes to the last stop-Cecilia Metella/via Appia Antica. Easy peasy! Rome’s grand aqueducts kept water flowing into the city for years, and amazingly many are still standing today. Now, the locals enjoy the park around them, rightfully named Aqueduct Park, but for a tourist, they are truly a sight to behold. I think this was one of Marty’s favorite things to do in Rome. He loved seeing the ancient aqueducts. From Rome, take the Metro line A to Giulio Agricola, then follow the signs to Viale Giulio Agricola. Head down the street toward the church. At the end of the street, enter the park to the right of the church and then pass under the small brick arches of the first set of aqueducts. Don’t stop here and think, really Michelle? No, these are the small aqueducts. I would not have sent you all the way out here for just that. Keep walking across the field and up the small hill to the Acqua Claudia, still standing from the first century A.D. After you have seen these, continue on the path to the left and come to the best preserved large section of aqueducts before having a picnic in the park. You really can’t miss this oversize monument, so you might as well check it out. Standing over 200 feet high and 500 feet wide, the scale of the monument is crazy in and of itself. Notice the statue of the king on his horse, I mean his mustache forms a five-foot-long arch?! It is cool to note that the base of the statue contains the Tomb of an Unknown Soldier. The monument is free to visit and has bathrooms inside, which is good to know in Rome. Don’t miss going to the rooftop to get a great view of Rome. Celebrating the Mary, the mother of Jesus, Santa Maria is one of Rome’s oldest churches. Built in 432 A.D., Santa Maria is an important church, thus indicated by the “Maggiore” in its name. The term “Maggiore” indicates that this church is owned by the Vatican and therefore significant. Inside you will find several pieces of wood that are said to be from Jesus’ crib along with several beautiful paintings and mosaics. As you’re roaming through Rome (see what I did there? LOL! ), you will notice that piazzas are everywhere. Rome’s piazzas, or squares, are not only a wonderful social hub, but many of them carry a great about of historical significance as well. I really liked how so many of the piazzas were surrounded by quaint cafes and charming restaurants. Find your favorite piazza and join the locals to enjoy the sweet life in Italy! Trust me, this made the list of top things to do in Rome for a reason, try it out, I think you will be glad you did! Campo de’Fiori was easily one of my favorite piazzas in Rome. The piazza hosts a fruit and vegetable market in the morning and then transforms into a great spot full of cafes and bar hoppers in the evening, thus making it a great place for one of my favorite things to do in Rome, people watch! On the weekend nights, the piazza is transformed into a big Roman street party. It’s awesome! The Pantheon is hands down Rome’s best-preserved monument, and therefore has to be on your list of things to do in Rome! The sheer architecture of this building will amaze you. While you visit, try to imagine building this perfectly precise mathematical structure without the use of modern technology. That alone makes this building awesome. The original structure was built in 27 B.C. as a temple dedicated to all of the gods. The temple burned and the structure you see today was built around 120 A.D. Once inside, you will notice the beautiful stone floor surrounding you that is still over 80 percent original. You can also view all of the tombs of famous people like Raphael and King Victor Emmanuel II. There are so many day trips that you can take out of Rome. While planning these, I think Tivoli should definitely be included on your list. Tivoli is a great little town located 18 miles east of Rome. It is super simple to get to by train, or you can book a guided tour and let them do all the planning for you. Tivoli’s highlights are the Villa d’Este, Hadrian’s Villa and the Villa Gregoriana. Avoid going on Monday if you want to visit the Villa d’Este, and trust us, you want to visit this villa, as the Villa d’Este is closed on Monday. Check out our post, Tivoli, the Perfect Day Trip from Rome, to learn more. A town truly frozen in time has to be on everyone’s list of things to do in Rome. Now, of course, Pompeii is not in Rome, but it is close enough to do a day trip, or better yet, do an overnight in Capri like we did before going to Pompeii. We spent 24 hours in Capri, Italy and loved it. Be prepared if you are doing Pompeii as a day trip, it is going to be a long day. 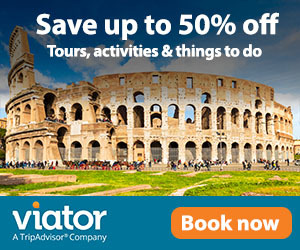 Allow the experts to do all the work for you by booking a Pompeii excursion like one of these. I was overwhelmed by the sheer size of Pompeii. This once thriving commercial port was literally stopped in its tracks when Mount Vesuvius erupted in A.D. 79. Today you can see the incredible remains that help to tell an amazing story about daily Roman life during this time period. Marty and I chose to explore Pompeii on our own, but I wish we would have hired a guide to help make the stories and history come to life that much more. Yes, eating gelato makes the list of awesome things to do in Rome. I mean, it’s gelato! If you’ve never had true gelato then you are in for a treat my friend. First, realize that gelato and ice cream are different. In my opinion, gelato is better than ice cream. You see, gelato is made with milk instead of cream like ice cream. Gelato is also turned more slowly, creating a more dense texture. Gelato became one of our go-to staples while in Rome. The little gelato shop across the street from our hotel got to know us, and despite the language barrier always got our order just right! I do think that I turned into a gelato snob while in Rome. You see, there is a difference in homemade gelato and mass-produced gelato. Look for gelateries that display the words artiginale, nostra produzione, or produzione propia, meaning that the gelato is fresh produces there on sight! Avoid places that have their gelato in plastic buckets with colors that don’t appear natural. True gelato shops will have their gelato displayed in metal tins and the color of their gelato will be more natural looking. The burial places for those who died in Rome during the ancient times was the catacombs. Located along the Appian Way, the catacombs were very interesting to visit. There are two catacombs of note along the Appian Way, the Catacombs of San Sebastiano and the Catacombs of San Callisto. Each has their own interesting history and are truly fascinating to explore. The Catacombs of San Callisto was the official cemetery for Rome’s early Christians, while the Catacombs of San Sebastiano was said to have the bodies of Peter and Paul kept there for several decades. Marty and I chose to visit the Catacombs of San Sebastiano. We marveled at the underground chapel and at the incredible pagan Roman tombs. You can’t be claustrophobic while visiting, there are narrow spaces that at times make you feel like the walls are closing in on you. Take a deep breath and continue on the tour as soon you will enter into a large open area. After the tour, be sure to visit the basilica on site to see the relics it houses. Of course, one of my absolute favorite things to do in Rome was drinking wine. I was pleasantly surprised at how good the house wine was at the restaurants we visited. When I can get a 1/2 liter of wine as cheap as water, you better believe that I’m choosing wine! Try out the different varieties and find the one you like best! This probably goes without saying, but the top of my list, besides drinking wine, is eating awesome Italian food. There is truly so much great food surrounding you in Rome. For a great introduction to this, take a food tour. We love taking food tours when we travel. Not only do they introduce you to the cuisine of the region, but it will likely force you to try food that you might not normally try. Taking a food tour also allows you direct access to a local foodie, your tour guide, to get recommendations from. A definite win! Venture across the Tiber river to the great neighborhood of Trastevere. Stepping into Trastevere, you will feel like you have stepped into a true medieval village. Take some time during the day to just wander around the neighborhood, or come at night to enjoy some of the nightlife of the area. Highlights of Trastevere include Villa Farnesina, the Church of Santa Maria in Trastevere, and the Piazzale Giuseppe Garibaldi. Get an in-depth locals perspective on Trastevere by taking one of the many Trastevere tours offered by Viator. Located in the area of Santa Croce, you will find a very significant place in the Christian community, the Basilica of the Holy Cross in Jerusalem. This historic church is one of the Seven Pilgrimage Churches of Rome. Inside you will find several relics from Jesus’ time on Calvary hill, including a part of the Cross, the nail, the Titulus, and the thorns from Jesus’ crown. The church also houses notable artwork, including several medieval frescoes. Marty and I actually stayed in the hotel that is attached to the basilica, Domus Sessoriana. The old monk quarters have been transformed into a modern hotel complete with air conditioning and private bathrooms. It was truly cool experience staying here. The public baths of the ancient Romans must be on everyone’s list of things to do in Rome. Known for their extravagance and grandeur, the Baths of Diocletian were some of the most spectacular. Built around 300 A.D. and spreading over 30 acres, these baths could cleanse 3,000 people at a time! Today, you can visit one section of the baths, the former main hall that has been transformed into the Church of Santa Maria degli Angeli. See if you can survive the “Mouth of Truth” located in the Church of Santa Maria in Cosmedin. According to legend, if you put your hand in the gaping hole of the mouth of the stone face in the porch wall and your hand gets gobbled up, then you are a liar. LOL! OK, this for sure is a quirky thing to make our list of things to do in Rome, but life needs a little quirky sometimes! Besides, since you’re here, you might as well step inside the church to see the beautiful medieval interior. Well, there you have it, our list of 25 Awesome Things to do in Rome. We would love to hear from you. Comment below and tell us what you look forward to doing in Rome, and while you’re here, be sure to subscribe to the blog so you don’t miss a minute of the fun! Don't forget to share our post on your favorite social media. Sign up now to receive updates from That Texas Couple, and to get our Ultimate Travel Bundle straight to your inbox! Sharing is Caring! Please Pin This Post or Share to Your Favorite Social Media! Grab One of These Awesome Travel Guides! Click on the photos to shop. Check Out Some of Our Travel Essentials! Click on the photos to shop. I do love Trastavere. One of my favorite memories is sitting with my friends drinking red wine and enjoying cacio e pepe while staring out over the Tiber. What a great trip you had! I agree, it can be disappointing when a famous site is undergoing serious renovations. That sounds like an incredible memory, Maggie! Funny how we always remember the food and wine! LOL! I know. I was absolutely mesmerized at all of the architecture for this reason! I have only had really short stays in Rome… no more than 24h at a time. So maybe altogether 48h, not even. Not nearly enough. And I haven’t had a proper full on Roman experience. I enjoyed your post so much, and I can see your love for this beautiful city. I keep seeing bits and pieces of Rome, but I’m going to plan a full on dedicated trip. It so deserves it! Yes, Ana! You really do need to plan to spend a week or longer in Rome. We were there for almost 3 weeks and still felt like there were things we didn’t get to see. That just means we have to go back! Haha i loved the pretend to be a Gladiator at the Colosseum bit! I so want to visit Rome – it’s been on my travel list forever. Last time we were in Europe we couldn’t go to Italy but next time we will. How many days do you recommend to tick all these 25 places? Hi Ketki! Rome is so much fun. You really should make it a point to go. My husband and I were there for almost 3 weeks, and we were able to do all of these items and take a couple of day trips. We do like to stay busy though, so our pace might be too much for some people. Rome was always the place I dreamed of going as well, so I truly understand. I appreciate the compliment on the pictures, but they truly don’t do it justice. Rome is just one of those places you have to see to believe :). I’m a fan of cheesecake also, so I understand!!! If ever there was a list designed to remind us why we need to return to Rome, this is it! I worked there for a summer as a student, with a bad case of too many hills to walk and an unrequited crush. I need to go back – your pictures not only do it great justice, but remind me that it’s much greener than my memories. And ah, the architecture! I should have saved my unrequited crush for the beauty of the buildings. You’re making me blush Bernie. Thank you so much. That is an amazing compliment coming from someone who lived in Rome. I would be interested to hear the story of that crush ;). Thank you, Suzy. My husband gets all the credit for the pictures. I do agree with you though. Every time I look at the pictures or talk about our trip I’m ready to go back! The architecture of Rome has always fascinated me. Such marvellous designs and artpieces. I love your bubbly narration and can imagine how exciting it must be to experience these wonders. Fabulous photos too. Thank you so much! I’ve been told I’m a little too bubbly sometimes. LOL! We appreciate you reading and interacting with our post! This couldn’t come at a better time – I’m in the process of planning my trip to Rome! What great ideas, and so many beautiful photos. Thanks so much! Yay! I’m so glad it will be helpful to you Sylvie. Let us know if you need any other information from us :). The Appian Way reminds me of San Juan Puerto Rico. I am glad you had such a positive attitude and found the puddle at Trevi. Yay, thank you for the comprehensive list. Will definitely bookmark this for our future trip. I’m so glad I found this list! I’m taking my parents there in October and we are all so excited to go and see the sights! I’m so glad to hear that you find the post helpful! I know that you are going to have a great time with your parents! I spent 6 months in Rome, doing my study abroad and this list is AWESOME! You really hit all the great stuff. I pinned it because we hope to take the kids to Italy soon! That’s so nice to hear, Harmony! Thank you!! That’s a great list you have here! I absolutely loved Rome when I visited it almost 4 years ago. My only regret is that I was only there for 3 days but the good part is that I managed to pack in the most of must-see places. The highlight was a dusk-time walk in Trastevere, a world away from all the touristy places. Trastevere is such a great neighborhood and well worth a visit! We spent about 3 weeks there and still wanted more! LOL! I loved my time in Rome and Rome-ing around. Okay, i’ll stopwiththe bad puns but really enjoyed most of these places. I missed a day tripto Tivili and the aqueducts so a totally goof excuse to go back and eat more gelato! I’m going to go back and I don’t even have an excuse other than I loved Rome! LOL! Wow you guys really DID Rome! The Pantheon was my favorite when I was there. Definitely a must-see. Nice list of what to do in Rome. Food is always a good idea! Ahh, I officially need to go to Rome! I love the rich history everywhere, looks like such an amazing place to wander and soak everything in. I just love Rome, there is so much to see and everything is so impressive. And its also so much fun to just sit and people watch with a glass of wine or some gelato. I really want to go back. I agree, Anisa! I’m glad to know we aren’t the only ones that can just sit and people watch for hours. LOL! This is an awesome list! I wish I’d had more time in Rome so I could do more of these. Visiting Castel Sant’Angelo wasn’t high on my list of must-dos when I went, but it ended up being one of my favorite spots. The view of the Vatican is great. I was so bummed that I didn’t get to visit the acqueducts though. My last day there was a religious holiday and unbeknownst to me, most of the bus lines weren’t running and after trying to get there for an hour, I had to give up. I have been to Rome several times, but there is still so much to experience! I have been dreaming of Pompeii ever since I heard about it as a child, so that is absolutely on the list for next time. Along with the food tour, I love doing those! Pompeii was awesome, Linn. Speaking of, I need to do a post on Pompeii. LOL! You should go back soon! It sounds like you did it right Lauen. You can’t go wrong with pizza, ice cream, and coffee in Rome!! Great post with awesome pictures. I have Rome on my vacation list. Yet I need to find a good amount of time off to enjoy this destination to the max. Seeing your guide it’s like someone will never have a dull moment. Very bummed about the Trevi Fountain though, but I can imagine that it’s never low season for them either. Thank you so much, Sujenne! My husband is the photographer so I will pass along the compliments. Yes, Rome will definitely keep you busy! Rome is an amazing city with so much history and beautiful architecture and not to forget all the delicious Italian food. Pompeii might not be in Rome but it’s definitely worth the day trip! I totally agree! I just couldn’t make a list without including Pompeii. Great list! I’ve visited Rome a few years ago but looks like I need to go back. There are a few things on your list I need to check out! Thank you so much, Jewels!! This is such a comprehensive list! This reminds me of my visit to Rome. I have not done all and it seems I will have to plan for a revisit. I completely understand, Chirasree. We will definitely be going back! Thanks for reading! Such a thorough and brilliant itinerary for Rome. The Trevi Fountain and Spanish Steps were my fav when I visited a few years back. Such a magical place. Thank you so much, Nichola. I would have loved the Trevi more had it not been under construction. LOL! You’re so right though, Rome is magical! I’ve always wanted to go to Rome! And everything I have ever wanted to do there is on this list, plus a few more! Saving this for later! Rome is absolutely incredible Anna! Thanks for reading and saving! That’s so great to hear, Geraldine. Thanks for reading!